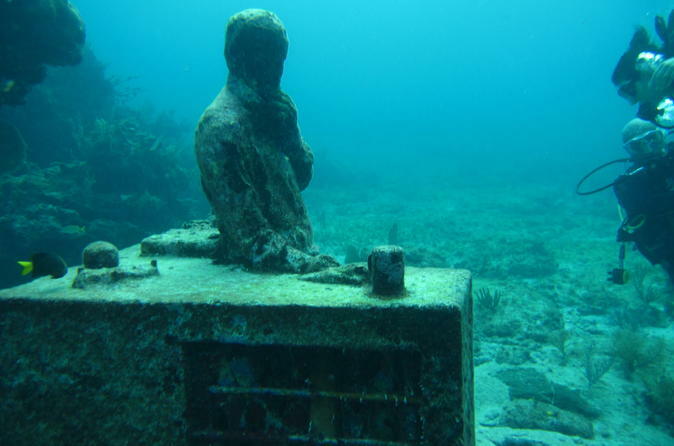 Take an introductory SCUBA course in Cancun and dive at one of Mexico's best diving spots. During this all-day adventure, learn the basics of scuba in a resort pool and then move to your first open-water dive. The one-tank dive on Cancun's local reefs does not require full certification, and all equipment is provided for you. Expert instructors are on hand to ensure you are safe and enjoy your time underwater. If you’re not a certified diver, learn how with a pool lesson and one open-water dive. Explore el mundo submarino que abre la certificación de buceo con este curso de buceo para principiantes en Cancún. Comience con una clase de 2 horas en tierra firme, donde aprenderá sobre técnicas de respiración, comunicación bajo el agua y cuidado y operación del equipo en un formato de conferencia. Deslícese en la piscina del resort para probar su equipo y aplicar sus nuevos conocimientos. Practique las señales de mano bajo el agua y domine la flotabilidad. Asegúrese de que su equipo se ajuste correctamente y consulte a su instructor si tiene alguna pregunta o inquietud. A continuación, es hora de salir al océano para visitar uno de los espectaculares lugares de buceo de Cancún. El instructor guiará a su pequeño grupo en su primera inmersión en aguas abiertas con un tanque de oxígeno cada uno. Explore el mundo submarino del Caribe de manera segura con su conocimiento fundamental del buceo. Esté atento a los tiburones, langostas y varias variedades de tortugas. This was my stepdaughters' (21 and 23) first diving experience and they loved it. The instruction was thorough and the actual dive excellent. They especially loved Hector, their guide, who was professional and fun. They got a lot for their $...even when you add in the extra $ for dock fees and the wet suit. Make sure to read the fine print!! 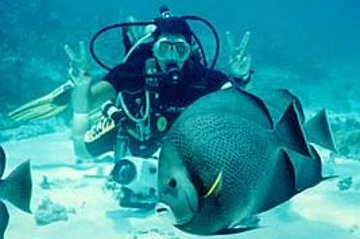 This is a great introductory course into scuba diving, the instructors are very attentive and they make sure you know how to use the scuba gear in the pool first before they take you out to the ocean, about an hour ride. the ocean dive is a 1 full tank dive, approximately 30-40 min, and takes you to a regular dive spot with depth of around 30 ft. anyone who loves snorkeling or ever thought about scuba diving this is the excursion for you! Had the beast trainer and team in the sea ever. It was my first time and I was fairly scared. I had the diver literally holding my hand all the time and the experience was just unforgettable. Just glad I lived something like that and had help to overcome my own fear. Thank you! I'm not terribly comfortable underwater, so this is well outside my comfort zone. The instructors explained everything both in and out of the pool and were very patient when it took me a little extra time to figure out how to maintain buoyancy. The reef dive was cool, but insanely crowded and not as bright and colorful as you hope for. The best part was actually the boat ride out to the reef riding through the mangroves and seeing the hotel zone from the water was just gorgeous, and I didn't get sick, which makes it way better. My mask didn't fit quite right, so I kept having to clear it, so if I want to dive again I'll consider buying my own mask. Great class. I was disappointed with the reef dive, only because there wasn't much too see. Did the 2 dive day trip to Cozumel the following day which was remarkable! My boys enjoyed this very much. Only complaint I heard was that there were some of the other divers having difficulty so the boys didn't get as much diving time that they would have liked.